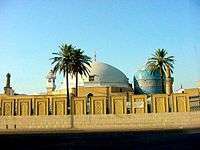 Other important Muslim mystics carry the name Suhrawardi, particularly Abu al-Najib Suhrawardi and his paternal nephew Shahab al-Din Abu Hafs Umar Suhrawardi. "Shahāb ad-Dīn" Yahya ibn Habash Suhrawardī (Persian: شهاب‌الدین سهروردی‎‎, also known as Sohrevardi) was a Persian philosopher and founder of the Iranian school of Illuminationism, an important school in Islamic philosophy and mysticism that drew upon Zoroastrian and Platonic ideas. The "light" in his "Philosophy of Illumination" is a divine and metaphysical source of knowledge. He is referred to by the honorific title Shaikh al-ʿIshraq "Master of Illumination" and Shaikh al-Maqtul "the Murdered Master", in reference to his execution for heresy. Mulla Sadra, the Persian sage of the Safavid era described Suhrawardi as the "Reviver of the Traces of the Pahlavi (Iranian) Sages", and Suhrawardi, in his magnum opus "The Philosophy of Illumination", thought of himself as a reviver or resuscitator of the ancient tradition of Persian wisdom. Suhraward is a village located between the present-day towns of Zanjan and Bijar Garrus in Iran, where Suhrawardi was born in 1154. He learned wisdom and jurisprudence in Maragheh (located today in the East Azarbaijan Province of Iran). His teacher was Majd al-Dīn Jīlī who was also Imam Fakhr Razi’s teacher. He then went to Iraq and Syria for several years and developed his knowledge while he was there. His life spanned a period of less than forty years during which he produced a series of works that established him as the founder of a new school of philosophy, called "Illuminism" (hikmat al-Ishraq). According to Henry Corbin, Suhrawardi "came later to be called the Master of Illumination (Shaikh-i-Ishraq) because his great aim was the renaissance of ancient Iranian wisdom". which Corbin specifies in various ways as the "project of reviving the philosophy of ancient Persia". In 1186, at the age of thirty-two, he completed his magnum opus, The Philosophy of Illumination. There are several contradictory reports of his death. The most commonly held view is that he was executed sometime between 1191 and 1208 in Aleppo on charges of cultivating Batini teachings and philosophy, by the order of al-Malik al-Zahir, son of Saladin. Other traditions hold that he starved himself to death, others tell that he was suffocated or thrown from the wall of the fortress, then burned. Arising out of peripatetic philosophy as developed by Ibn Sina (Avicenna), Suhrawardi's illuminationist philosophy is critical of several of Ibn Sina's positions and radically departs from him in creating a symbolic language (mainly derived from ancient Iranian culture or Farhang-e Khosravani) to give expression to his wisdom (hikma). Suhrawardi taught a complex and profound emanationist cosmology, in which all creation is a successive outflow from the original Supreme Light of Lights (Nur al-Anwar). The fundamental of his philosophy is pure immaterial light, where nothing is manifest, and which unfolds from the Light of Lights in a descending order of ever-diminishing intensity and, through complex interaction, gives rise to a "horizontal" array of lights, similar in conception to Platonic forms, that governs mundane reality. In other words, the universe and all levels of existence are but varying degrees of Light—light and darkness. In his division of bodies, he categorizes objects in terms of their reception or non-reception of light. Suhrawardi considers a previous existence for every soul in the angelic realm before its descent to the realm of the body. The soul is divided into two parts, one remains in heaven and the other descends into the dungeon of the body. The human soul is always sad because it has been divorced from its other half. Therefore, it aspires to become reunited with it. The soul can only reach felicity again when it is united with its celestial part, which has remained in heaven. He holds that the soul should seek felicity by detaching itself from its tenebrous body and worldly matters and access the world of immaterial lights. The souls of the gnostics and saints, after leaving the body, ascend even above the angelic world to enjoy proximity to the Supreme Light, which is the only absolute Reality. Suhrawardi elaborated the neo-Platonic idea of an independent intermediary world, the imaginal world (ʿalam-i mithal عالم مثال). His views have exerted a powerful influence down to this day, particularly through Mulla Sadra’s combined peripatetic and illuminationist description of reality. Suhrawardi's Illuminationist project was to have far-reaching consequences for Islamic philosophy in Shi'ite Iran. His teachings had a strong influence on subsequent esoteric Iranian thought and the idea of “Decisive Necessity” is believed to be one of the most important innovations in the history of logical philosophical speculation, stressed by the majority of Muslim logicians and philosophers. In the 17th century, it was to initiate an Illuminationist Zoroastrian revival in the figure of the 16th century sage Azar Kayvan. Suhrawardi uses pre-Islamic Iranian gnosis, synthesizing it with Greek and Islamic wisdom. The main influence from pre-Islamic Iranian thought on Suhrawardi is in the realm of angelology and cosmology. He believed that the ancient Persians' wisdom was shared by Greek philosophers such as Plato as well as by the Egyptian Hermes and considered his philosophy of illumination a rediscovery of this ancient wisdom. According to Nasr, Suhrawardi provides an important link between the thought of pre-Islamic and post-Islamic Iran and a harmonious synthesis between the two. And Henry Corbin states: "In northwestern Iran, Sohravardi (d. 1191) carried out the great project of reviving the wisdom or theosophy of ancient pre-Islamic Zoroastrian Iran." In his work Alwah Imadi, Suhrawardi offers an esoteric interpretation of Ferdowsi's Epic of Kings (Shah Nama) in which figures such as Fereydun, Zahak, Kay Khusraw and Jamshid are seen as manifestations of the divine light. Seyyed Hossein Nasr states: "Alwah 'Imadi is one of the most brilliant works of Suhrawardi in which the tales of ancient Persia and the wisdom of gnosis of antiquity in the context of the esoteric meaning of the Quran have been synthesized". In this Persian work Partaw Nama and his main Arabic work Hikmat al-Ishraq, Suhrawardi makes extensive use of Zoroastrian symbolism and his elaborate angelology is also based on Zoroastrian models. The supreme light he calls both by its Quranic and Mazdean names, al-nur al-a'zam (the Supreme Light) and Vohuman (Bahman). Suhrawardi refers to the hukamayya-fars (Persian philosophers) as major practitioners of his Ishraqi wisdom and considers Zoroaster, Jamasp, Goshtasp, Kay Khusraw, Frashostar and Bozorgmehr as possessors of this ancient wisdom. Among pre-Islamic Iranian symbols and concepts used by Suhrawardi are: minu (incorporeal world), giti (corporeal world), Surush (messenger, Gabriel), Farvardin (the lower world), gawhar (pure essence), Bahram, Hurakhsh (the Sun), shahriyar (archetype of species), isfahbad (light in the body), Amordad (Zoroastrian angel), Shahrivar (Zoroastrian angel), and the Kiyani Khvarenah. "Whoever knows philosophy (hikmat) and perseveres in thanking and sanctifying the Light of the Lights, will be endowed with royal glory (kharreh) and with luminous splendor (farreh), and—as we have said elsewhere—divine light will further bestow upon him the cloak of royal power and value. Such a person shall then become the natural ruler of the universe. He shall be given aid from the high heavens, and whatever he commands shall be obeyed; and his dreams and inspirations will reach their uppermost, perfect pinnacle." According to Hosein Nasr since Sheykh Ishraq was not translated into Western languages in the medieval period, European had little knowledge about Suhrevardi and his philosophy. His school is ignored even now by later scholars. Sheykh Ishraq tried to pose new perspective on questions like the question of Existence. He not only caused peripatetic philosophers to confront new questions but also gave new live to the body of philosophy after Avicenna. According to John Walbridge, Suhrevardi's critiques on peripatetic philosophy could have been counted as an important turning point for his successors. Suhrevrdi tried to criticize Avicennism in a new approach. Although Suhrevardi first was a pioneer of peripatetic philosophy he later became a Platonist following a mystical experience. He is also considered as the one who revived the ancient wisdom of Persia by his philosophy of illumination. His followers include other Persian philosophers such as Shahrazuri and Qutb al-Din al-Shirazi who tried to continue the way of their teacher. Suhrevardi made a distinction between two approaches in the philosophy of illumination: one approach is discursive and the other is intuitive. There are different and challenging views on characters of Shhrevardi's school. Some scholars such as Hosein Ziaei believe that the most important aspects of Suhrevardi's thought are his logic and his critiques on peripatetics view on definition. On other hand some other scholars like Mehdi Hairi and Sayyid Jalal Addin Ashtiyyani,believe that Suhrevardi remained in the framework of peripatetic philosophy and neo-Avicennian philosophy. Also Mehdi Amin Razavi criticize the first and second groups because they ignore the mystical dimension of Suhrevardi's literature. Also scholars such as Corbin and Nasr know Surevardi as a theosophist. They focused on the more mystical dimension of his work. Suhrawardi left over 50 writings in Persian and Arabic. ↑ Bosworth, C.E. ; van Donzel, E.; Heinrichs, W.P. ; Lecomte, G. (1997). Encyclopaedia of Islam (New Edition). Volume IX (San-Sze). Leiden, Netherlands: Brill. p. 781. ISBN 9004104224. ↑ Ziai, H.(1997), “Al-Suhrawardi”, Encyclopaedia of Islam, New Ed., vol. 9: 782-784. Quote: "AL-SUHRAWARDI, SHIHAB AL-DIN YAHYA b. Habash b. Amirak, Abu'1-Futuh, well known Persian innovative philosopher-scientist, and founder of an independent, non-Aristotelian philosophical school named the "Philosophy of Illumination" (Ḥikmat al-ʿishraq)"
↑ Matthew Kapstein, University of Chicago Press, 2004, "The presence of light: divine radiance and religious experience", University of Chicago Press, 2004. pg 285: "the light of lights in the system of the Persian philosopher Suhrawardi"
↑ Hossein Ziai. Illuminationism or Illuminationist philosophy, first introduced in the 12th century as a complete, reconstructed system distinct both from the Peripatetic philosophy of Avicenna and from theological philosophy. in: Encyclopædia Iranica, Volumes XII & XIII. 2004. 1 2 Edward Craig, Routledge Encyclopedia of Philosophy, "al-Suhrawardi, Shihab al-Din Yahya (1154-91)" Routledge 1998. Excerpt: "Shihab al-Din Yahya ibn Habash ibn Amirak Abu’l-Futuh al-Suhrawardi, known as al-Maqtul (the Slain One) in reference to his execution, and usually referred to as Shaykh al-Ishraq after his school of Illuminationist philosophy (hikmat al-ishraq), was born in AH 549/AD 1154 in the village of Suhraward in northwestern Iran." ↑ Donald M. Borchert, Encyclopedia of Philosophy, Vol. 9 Gale / Cengage Learning 2nd. Edition, 2006. "suhraward ̄i, [addendum] (1155 or 1156–1191)" Excerpt: "Shihab al-Din Suhrawardi is one of the best known, innovative, yet controversial Persian philosophers in the history of philosophy in Iran." 1 2 Dabashi, Hamid (20 November 2012). The World of Persian Literary Humanism. Harvard University Press. p. 115. ISBN 978-0-674-06759-2. 1 2 Henry Corbin, "The Voyage and the Messenger: Iran and Philosophy", North Atlantic Books, 1998. pg XLV: "There was among the ancient Persians a community of people guided by God who thus walked the true way, worthy Sage-Philosophers, with no resemblance to the Magi (Dualists). It is their precious philosophy of Light, the same as that to which the mystical experience of Plato and his predecessors bear witness, that we have revived in our book called Oriental Theosophy (Hikmat al-'Ishraq), and I have had no precursor in the way of such project." ↑ H.Corbin, Spiritual Body and Celestial Earth (From Mazdean Iran to Shi'ite Iran), translated from French by Nancy Pearson, Princeton, 1977. (1:Paris, 1960), pg. 54. ↑ Henry Corbin. The Voyage and the Messenger. Iran and Philosophy. Containing previous unpublished articles and lectures from 1948 to 1976. North Atlantic Books. Berkeley, California. 1998. ISBN 1-55643-269-0. 1 2 3 4 5 6 7 Amin Razavi, M. (1997) Suhrawardi and the School of Illumination, Richmond: Curzon Press. ↑ Hossein Ziai, "The book of radiance", Mazda Publisher, 1998. pg 84-85. Note that Ziai, whose extensive studies establish Suhrawardi as a rationalist thinker rather than an "Oriental mystic" translates the word Hikmat (wisdom) as "philosophy" rather than "wisdom," as is more common. ↑ Hosein Nasr, Three Muslim Sages, 1997, p. 55. ↑ Hosein Nasr, Islamic philosophy from its origin to the present, 2006, p. 86. ↑ Walbridge, J., 'Suhrawardi and Illuminationism' in Adamson and Taylor, 2005, p. 201–223. Walbridge, John(1999) The Leaven of the Ancients: Suhrawardi and the Heritage of the Greeks, Albany, New York: State University of New York Press. Walbridge, John (2001) The Wisdom of the Mystic East: Suhrawardi and Platonic Orientalism, Albany, New York: State University of New York Press. The Shape of Light Translation of the Hayakal al-Nur, at archive.org.